Mexico’s publicly traded carriers Aeromexico and Volaris battled tough economic conditions in the country during 3Q2013 as FY2013 GDP growth estimates for Mexico continue to fall. To compensate both carriers are adopting strategies to preserve passenger volumes at the expense of yield, with Aeromexico in particular emphasising it aims to defend its position in the domestic market. Even as yield pressure lingers into 4Q2013, both airlines are seeing positive booking trends for the last quarter of the year and into 2014. And each carrier appears to be focusing on international expansion in the short term to combat some of the weakness created by Mexico’s sluggish economy. Outlining the deteriorating economic conditions in Mexico, the Mexican General Economic Activity Indicator (IGAE) increased just 1.2% during the first seven months of 2013 compared with 4% growth the year prior. During 3Q2013 the country’s finance ministry lowered Mexico’s annual economic growth forecast from 3% to 1.7%. Against that backdrop Aeromexico managed to grow net income by 17% year-on-year during 3Q2013 to MXP495 million (USD37.8 million). Its overall revenues grew just 0.4% to MXP10.4 billion (USD795 million) while passenger revenues declined 1.4% to MXP9.3 billion (USD710 million). Its top line operating expenses were largely flat year-on-year, inching up 0.9% to MXP9.6 billion (USD733 million). Aeromexico’s operating profit grew 8% during 3Q2013 to MXP834 million (USD64 million). Volaris also turned a respectable performance for its first quarter as a publicly traded company, growing its profits excluding special items by nearly 39% during 3Q2013 to MXP319 million (USD24 million). Both top line expenses and revenues increased roughly 11% to MXP3.3 billion (USD257 million) and MXP3.7 billion (USD286 million), respectively. 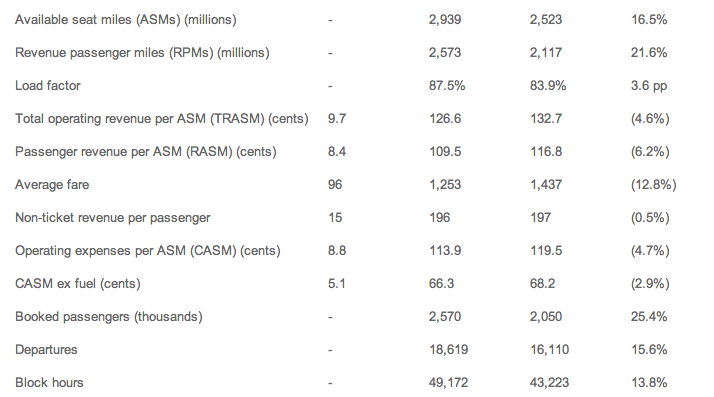 Both carriers experienced yield pressure during 3Q2013 as Aeromexico’s yields sank 8.9% while Volaris’ average fare dropped 12.8% year-on-year to USD96. The decrease in yields at Aeromexico reflects a new revenue management policy the carrier has instituted in the domestic market that favours load factors over yields. 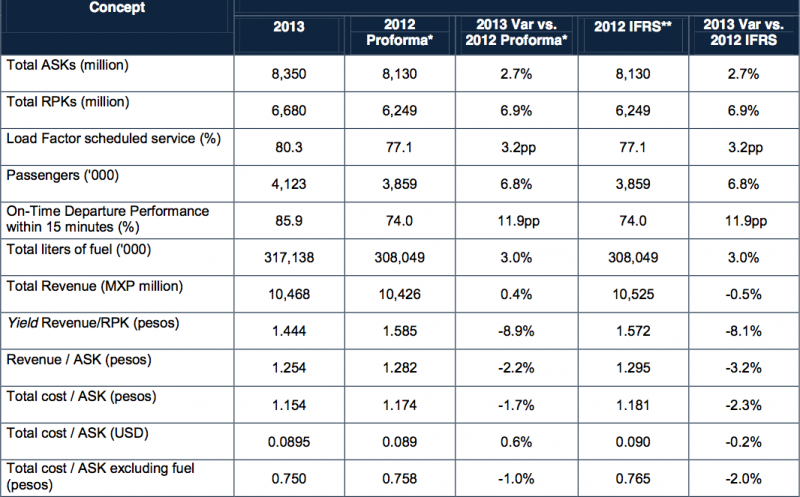 The approach was reflected in Aeromexico’s 3.2ppt rise year-on-year in load factors in 3Q2013 to 80.3%. During a recent discussion with analysts, Aeromexico CEO Andres Conesa explained that in part, the shift was designed to help improve Aeromexico’s domestic market share. Based on data from the Mexican government, Grupo Aeromexico (which includes Aeromexico Connect) recorded a 1ppt rise in domestic market share to 38% in Sep-2013. Volaris remarked that it accounted for 48% of the passenger volume growth in the Mexican domestic market during the first eight months of 2013 as overall passenger levels for that period of time grew 9.5%. 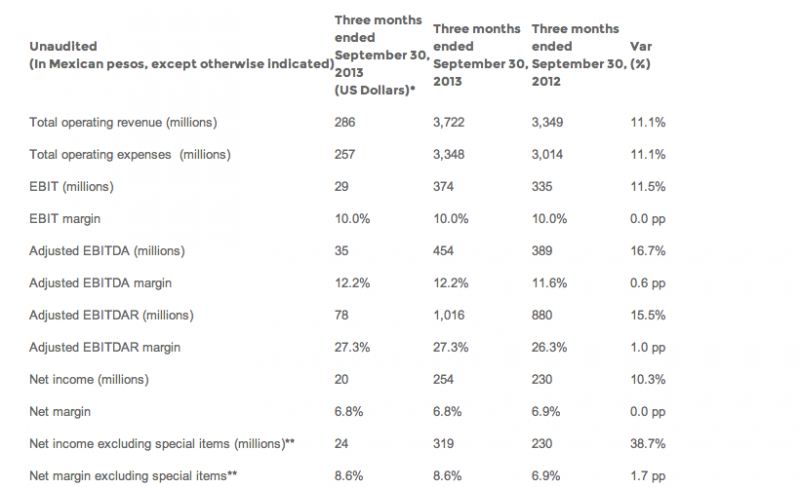 Volaris, which during the past year has made a pronounced push in the domestic market, increased its share among Mexico’s domestic carriers 3ppt year-on-year in Sep-2013 to 23%. In 3Q2013 alone it launched six new domestic routes. During the carrier’s first earnings discussion with analysts, Volaris CEO Enrique Beltranena explained that his company was also working to maximise passenger volume and load factor, which increased 3.6ppt year-on-year during the third quarter to 87.5%. The boost in load came at the expense of yields, but Mr Beltranena remarked Volaris’ current approach to revenue management reflects its goal of driving passengers from Mexican bus markets to air travel. Volaris’ 6% drop in passenger unit revenues during the quarter shows that in the current economic environment fares are even lower in order to sustain volumes. Volaris also reasons that its cost advantage supports its current revenue management scheme as Mr Beltranena declared that “it is very clear the lowest cost wins”. The carrier’s unit cost excluding fuel fell 2.9% year-on-year during 3Q2013 and Mr Beltranena boasted that Volaris has a 39% cost advantage over its “major domestic and international competitor”. Aeromexico recorded a 1% decline in unit cost excluding fuel in 3Q2013, as Mr Conesa stressed that the carrier is also on a quest to reduce costs, underpinned by the replacement of smaller 50-seat Embraer ERJ-145s with larger gauge Embraer 170s and 190s at Aeromexico Connect and replacing Boeing 737-700s at the mainline with higher density -800s. He also believes that Aeromexico now has more competitive contracts in place with its labour groups, which should also help to reduce its unit costs in the domestic market place. Throughout his discussion with analysts Mr Conesa stressed that Aeromexico is working to maintain its leadership in the domestic market going forward. But at the same time the carrier has taken aim at Volaris in Guadalajara with the launch of a new low fare product dubbed Contigo in Oct-2013. The operation encompasses four 174-seat Boeing 737-800s (versus a 160-seat, three class configuration in Aeromexico’s other -800s). Contigo’s jets have three rows with more legroom, and the overall product also had a dedicated call centre and personal check-in assistance at some airports. Previously, Aeromexico has stated that it is targeting migrant customers residing in Mexico or the US, and as of 23-Oct-2013 the carrier had transported roughly 40,000 passengers on the higher-density narrowbodies. Mr Conesa remarked that bookings on Contigo for the remainder of 2013 look promising, and he believes Aeromexico now has a more competitive offering on the routes where the Contigo jets operate alongside Volaris, including more frequencies. When queried about the launch of Contigo Mr Beltranena stated that Volaris believes the new product is positive in terms of moving passengers from buses to air travel, but also remarked that Aeromexico’s domestic operating margins have been falling. While he believes adding seats is good to capture bus travellers, he also said it could reduce yields which will “only make their margins worse”. Despite economic headwinds in Mexico, Volaris plans to grow its 4Q2013 capacity year-over-year by 19% to 20%. But Mr Beltranena stated most of that growth will be in international markets. Volaris in Oct-2013 introduced new service from Guadalajara to Phoenix and in Dec-2013 plans to launch service from Mexico City to Phoenix and from Guadalajara to San Antonio. Volaris is acknowledging that it continues to see sustained pressure on domestic yields, but it will continue to build its load factor and stimulate markets. The carrier stated advance bookings for Nov-2013 and Dec-2013 look robust. Aeromexico, meanwhile, it taking an optimistic view of 2014 as it plans 8% capacity expansion as economic conditions in Mexico are expected to improve. The growth is split 60% international and 40% domestic; however, Mr Conesa remarked that Aeromexico presently has no plans to introduce any new markets outside of Mexico during 2014. By YE2013 Aeromexico will be operating three Boeing 787 widebodies on routes to Tokyo Narita, New York JFK and Paris. For the moment it seems Aeromexico and Volaris are weathering the economic headwinds in Mexico fairly well. But it is not certain if trading loads for yields is sustainable over the long term given that containing costs is a constant struggle – even for low-cost carriers. With the hopes that Mexico’s economy will start to rebound in 2014, perhaps the carriers can achieve some pricing traction – if Mexico’s other carriers including Interjet and VivaAerobus also show pricing restraint. This is a growing and highly competitive market, so restraint may not be seen as their best strategy, if sacrificing short-term gain leads to longer-term strength.